Bulhak, Yosafat Ihnatii [Булгак, Йосафат Ігнатій; Bulhak, Josafat Ihnatij], b 10 April 1758, d 23 February 1838 in Saint Petersburg. Uniate bishop of Pynsk (1790–5), removed from this office by Catherine II. 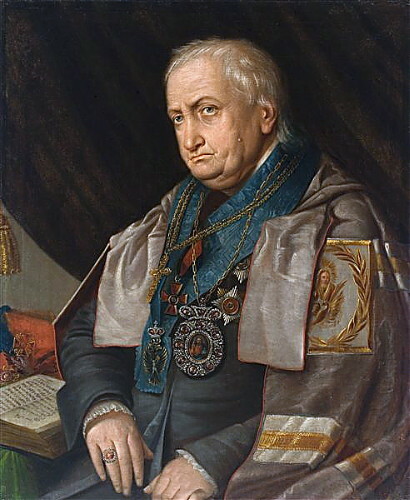 In 1798 he became bishop of Berestia (Brest) and in 1817 metropolitan of the Uniate church in Russia (without the title ‘of Kyiv’); the Vatican confirmed this appointment in 1818 by making him ‘apostolic delegate.’ Bulhak was the last Greek Catholic metropolitan of Kyiv (see Kyiv metropoly) before the abolition of the Church Union of Berestia in 1839 in all territories of the Russian Empire except the Kholm region and Podlachia.